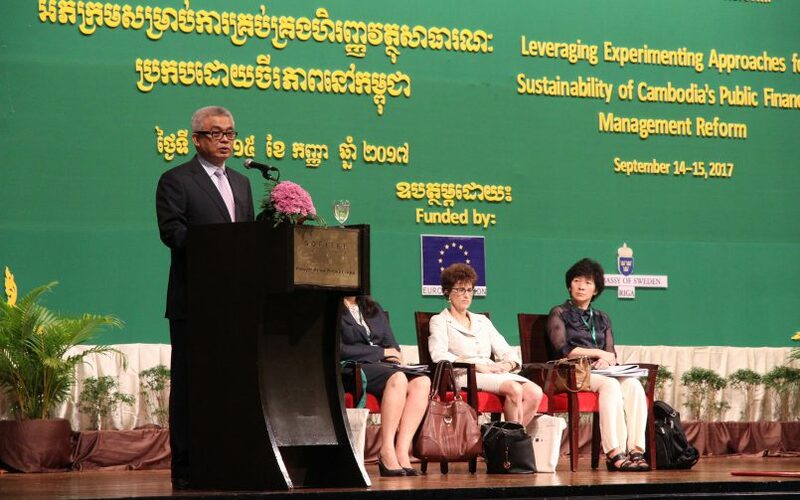 “I would like to take this opportunity to emphasize that the very last goal of public financial management reform is to maintain Peace, Security, Economic Development and the moving forward of Cambodian Society by promoting economic growth, jobs creation, assurance of equity and the promotion of effectiveness, which is a priority in the rectangular strategy of Samdach Akeak Moha Sena Padey Techo Hun Sen Prime Minister of the Kingdom of Cambodia. In this sense, only public financial management system that has international best practices could help Cambodia to achieve the goals.” The statement was raised by H.E Academician Aun Pornmoniroth, Senior Minister, Minister of Economy and Finance, in the international workshop on Lessons from Public Financial Management/Public Sector Reform: Leveraging Experimenting Approaches for Sustainability of Cambodia’s Public Financial Management Reform which was conducted on September 14-15, 2017 at Sofitel Phnom Penh Hotel. This international workshop has gathered the presences of top management, members, and officials from all line-ministries, international delegates and experts as well as development partners. H.E Academician emphasized further that while the level of development of Cambodia is rising up and getting more complicated, public financial management system is much needed to evolve further towards efficiency and flexibility contributing to solve new challenges especially to maintain the sustainability. In that occasion, Mrs. Ellen Goldstein, World Bank Country Director (Cambodia, Myanmar, and Laos) has also acknowledged on the achievements that the royal government of Cambodia has put a lot of efforts on reforming. Ellen underlined that Cambodia used to depend on external funding for the government’s expenditure; however, when public financial management reform came in and has been further strengthened, Cambodia is now able to collect more revenues reaching cash surplus and additionally starting to have Financial Management Information System (FMIS).